Become the ultimate investor. End those fears that keep you up at night regarding the financial choices you make. By reading Rich Dad’s basic rules of investing, you can reduce your investment risk and convert your earned income into passive and portfolio income. That means you keep more of your income-not the government. 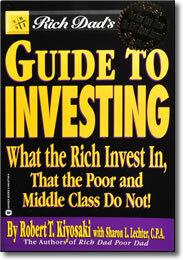 Rich Dad’s Guide to Investing is just that – a guide. It offers no guarantees, just as Robert Kiyosaki’s rich dad offered him no guarantees — only guidance. But if you’re interested in the inside look at an entrepreneur’s financial plan to be rich, this is the book for you.